"OH MY GOD! THEY ARE PERFECT! You obviously worked very hard...over and above. I am blown away...thank you. From the bottom of my heart. Thank you..."
"We highly recommend Lamb Sign Company and have appreciated the craftsmanship and hard work that Elizabeth and Jimmy put into creating a small sign for our mountain cottage. We shopped around among sign companies and were intrigued by the website for Lamb. At our first meeting with Elizabeth and Jimmy we were impressed with their enthusiasm for working on our project. Throughout the process we continued to appreciate their professional expertise, attention to detail, their willingness to involve us in the design process, their consistent ability to meet deadlines, and the value they offered at a reasonable cost. We are very satisfied customers." "Jimmy and Elizabeth were great to work with and they created a beautiful sign for my business in good time and for a reasonable price. Lamb Sign Company is just the kind of family-run business full of honesty and integrity that I love to support. It has been less than a week since I installed my sign and I have already recommended this company to several other people who asked 'Where did you get that beautiful sign made?'" "Being a brand new business owner working on a tight budget I contacted several different sign companies. One didn't return my call. One learning that I was working on a budget stopped contact. Lamb signs was absolutely GREAT!!! They came out to my place of business. We discussed my budget and the different option available. We worked together to develop a sign that is PERFECT on my budget!! I highly recommend them. Kind, generous, professional, and talented. Just the kind of people to do business with!" "Elizabeth and Jimmy were a joy to work with. 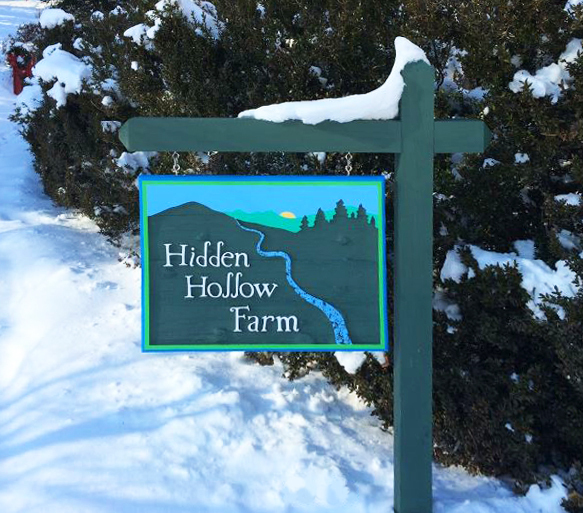 From a rough concept and drawing in my mind, they were able to create a stunning and creative sign for our small farm. It was a surprise Christmas gift for my husband and they worked on a tight schedule to get it to me in time for Christmas! Their customer service ethic is outstanding and they are delightful folks to know. We recommend them highly!" "I needed a wooden sign to accent my recently painted Asheville, NC home. Fortunately for me, I discovered a wonderful, local, handcrafted sign business in nearby Fairview. Elizabeth and Jimmy are experts at creating beautiful signs, including mine. They also possess southern hospitality making me feel as if I gave them a huge order, instead of just a small project. All in all, I had a great experience dealing with Lamb Sign Company and would definitely use them again."